What are the chances that two readers would send me photos of their PHADV stoves on the same day?! In my last post I showed an unusual ADV-668-7 stove. 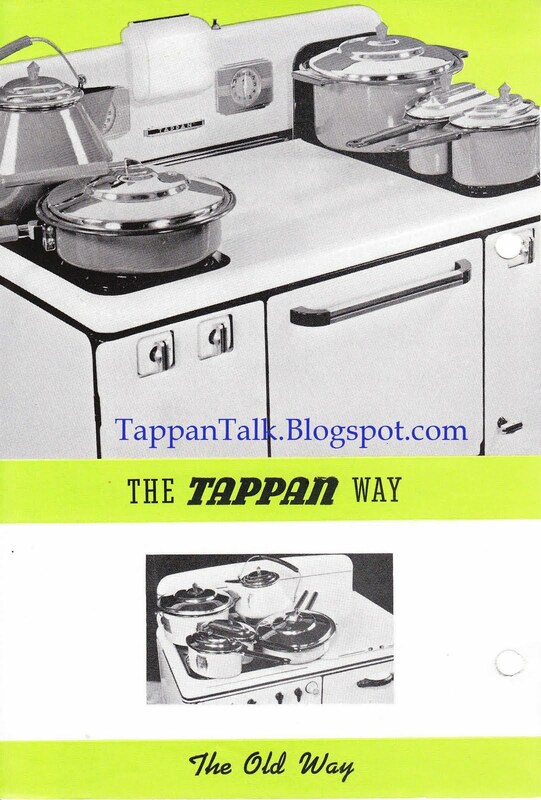 "Just wanted to send you some pictures of our stove, 'Tilley Tappan'. She is a Philgas Tappan. 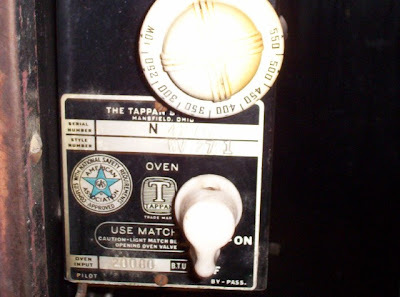 She has a Robertshaw knob for the thermostat on the oven. 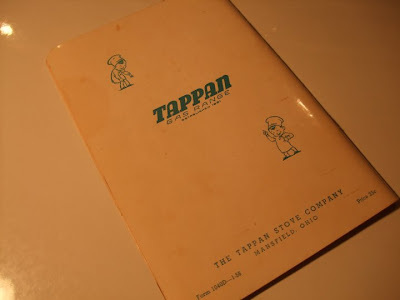 I read somewhere on this site that that is kinda rare that Robertshaw is mentioned on a Tappan. I bake a lot...and this oven is by far the best oven I have ever used. Thing come out evenly browned and cakes rise level and not lopsided from one side hotter then the other. The inside is all chrome and it seems to reflect the heat nicely. Here is question for all of you, have you ever seen another Tappan with the front burners like ours? The outside is a big ring of fire but the center is a small ring for gentlely melting chocolate or making cheese sauces that you don't want to scorch? 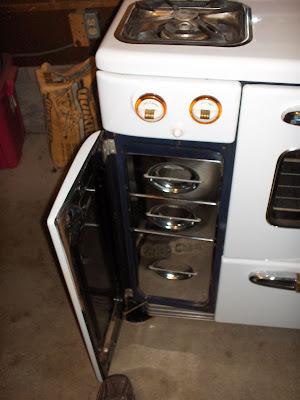 Also, when we bought this cooking marvel from the Goodwill store, it had a cracked front grate. I need another. Anybody got one? It's fun to receive notes from people that do serious baking & cooking with their stoves. This is probably the #1 question I received about the stoves....how do they bake? 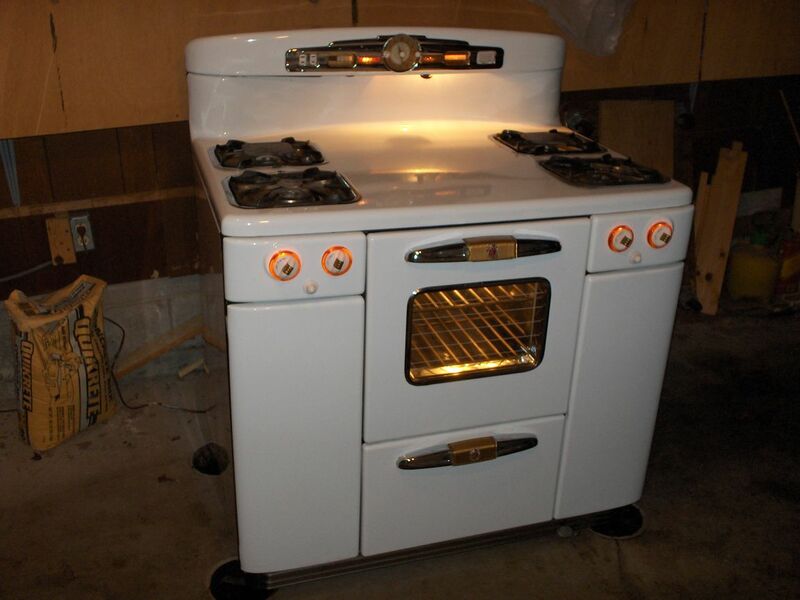 This is another one of these stoves with a combination of interesting features: chrome knob rings, stove top knobs say front and rear (I haven't seen this before, but went back to check Michale B's PHADV stove and his also has these knobs), chrome trim around the oven window, and Time Control clock for the automatic oven. Philgas Tappan appears on the oven door, a nice touch I also have not seen before. It's a Super 60 stove. Also, notice the cute Tappan Doughboy salt & pepper shakers. As first I didn't pay a lot of attention to the question about the burner. I thought it referred to a "giant" burner that has a ring of flames on the outside & inside, but then I took a closer look. No, this burner was not like that at all. It has a mini-burner inside the large burners. And take a look at the interesting burner grates - with a small circle in the center. This topic inspired a lot of email exchange.....and I'm going to save some of it for another post devoted solely to this type of burner. Rudiedog, thanks for sharing photos of Tilley Tappan. Does your Owner's Manual have a date on the inside cover or on the back? And, I just noticed the switch on the upper right hand corner of the back splash....is this for the oven light?? I received an email from Michael over at the Cul-De-Sacshack blog with photos of his new Tappan Deluxe stove...and a mystery. 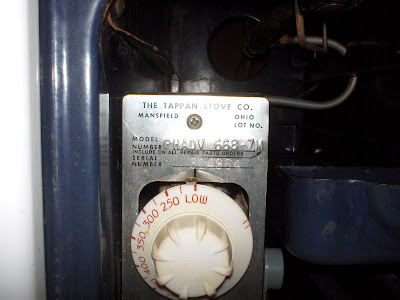 Michael's stove has the model #PHADV 668-7M with serial number 314964. It came with it's original owner's manual. The gentleman that sold the stove told Michael that the stove was a 1958 model. 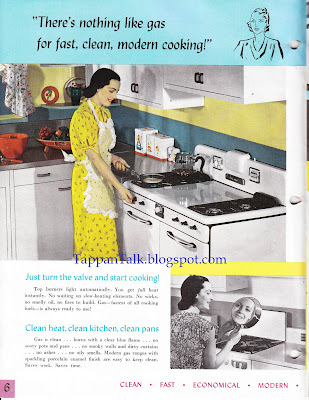 The story that came with the stove was that it was a display at the 1957 Missouri State Fair and that it was purchased there and that the new owner had to wait for the fair to end to take possession of it. My first reaction in responding to Michael's email was to assume that some of the dates had been remembered incorrectly. 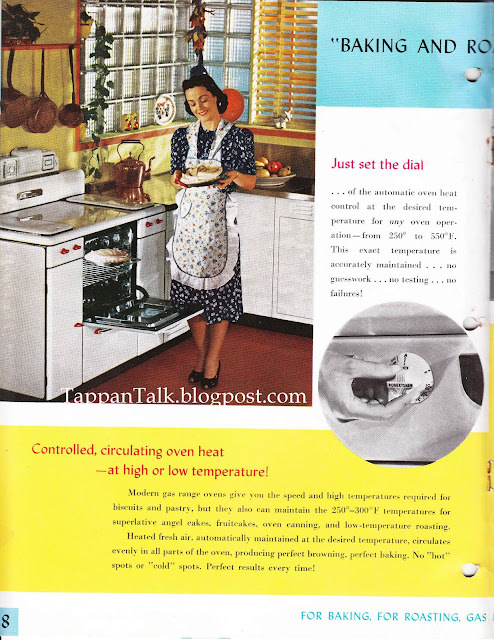 Deluxe stoves were essentially made from 1947 to 1954...or so we thought. I guessed the stove was probably from 1950 or 1951. 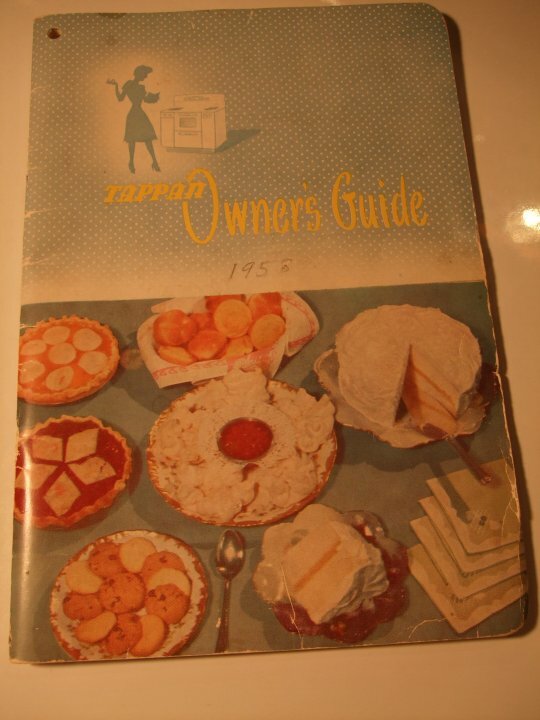 I suggested that Michael look on the inside cover page of the original Owner's Manual and locate the date that appeared below Betty Brown's letter. I thought for sure I'd get an email back saying the date under the letter was 1950. But, the plot thickened with the return email. 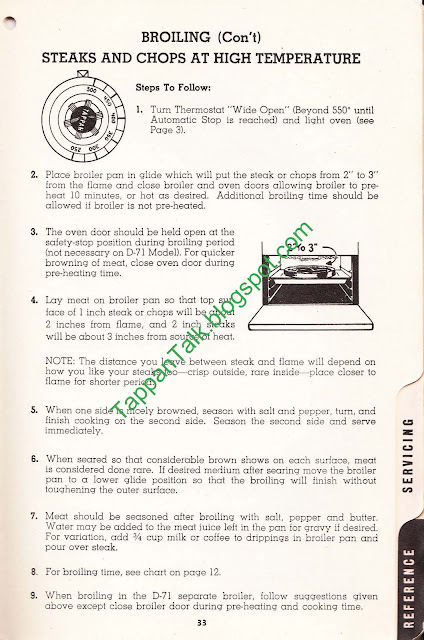 The stove's Owner's Manual did not have a date on the inside cover. However, it did appear to have an issue date on the back cover of the manual - "1040D 1-56." (most likely meaning January 1956). On the cover someone wrote "1958." 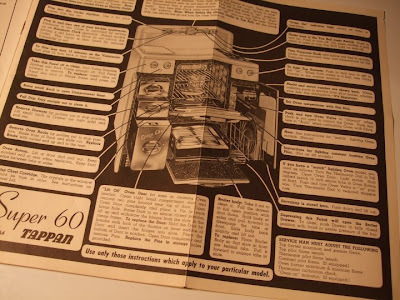 Note that the manual is for a "Super 60" (which up to this point, I thought was the stainless steel model - I haven't posted about yet). This stove has all of the bells & whistles - amber glass burner rings, crisper drawers, the glass pyrogrates on the back burner grates, chrome trim around the oven window. This tells us this was an upper end model or a special build (remember Ron & Aiden's stove that was made specifically for one housing development?). The type of stove that might be put on display. We know the features on this stove were new in the late 1940's...became common options in 1950. So, they weren't new in 1957. The model AV 669 is a 1950-51 version. The model numbers aren't always in sequence, but it would seem 668 *should* be right around this time. The Deluxe models were being phased out in 1953-54. At that point they started to become much more mid-century modern. 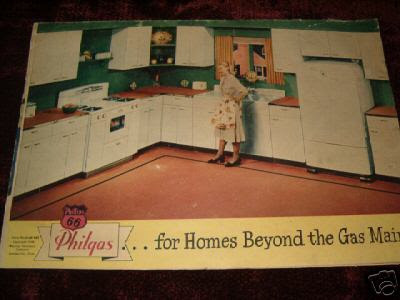 But, there is strong evidence telling us the stove was from the State Fair. Could this stove have been part of something like a "stoves over time" display? Any info, thoughts, additional observations, guesses? Thanks Michael for sharing your photos and story. My 1940's company sales manual includes illustrations of the current year Tappan stoves they produced for Philgas....but it also includes some general promo pieces for Tappan that use older versions of stoves (I'm sure these pieces were not updated annually). 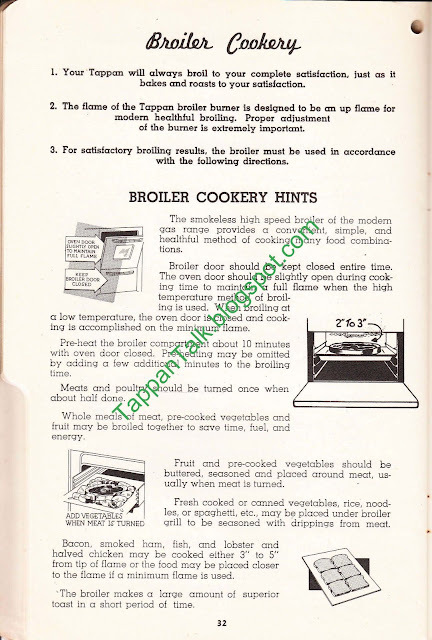 So, I pulled out this manual and took a look through it's pages looking for an illustration of a similar stove. Bingo. The manual includes general promo pieces that include illustration of a stove similar to this model. The promo pieces are talking about the new "divided top" work space..and the "ease of cleaning" the burners. This places this stove in the late 1930's. One thing that makes me think this may be a 1937 or 1938 stove is that the burner handles and oven/broiler handles are more of a boxy shape..and that back splash has a timer & a clock. 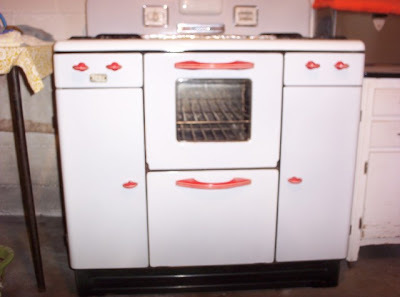 Compare this to Ron's stove, which is similar but most likely a little later, that has rounded oven door handles and a Visiminder. Both stove have that very nice opal glass back splash light. Also take a look at the burner covers on this stove.....they slide down in back for storage! Very cool. 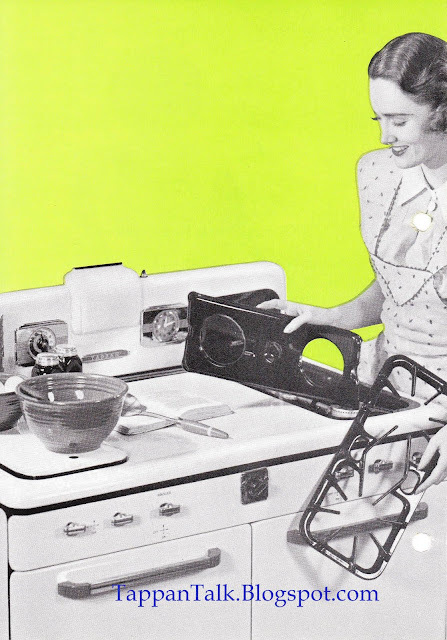 The oven window seemed to be an option into the early 1950's. 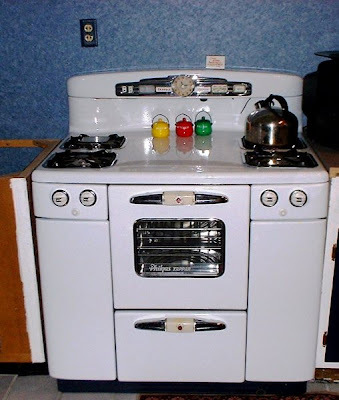 It looks like this stove also came in a two oven body....which makes me think this was at just the time when the switch to the Deluxe (oven in the middle w/ storage on each side) body style was taking place. I'm curious what is on the floor in the right hand storage. It looks built in. Any ideas? 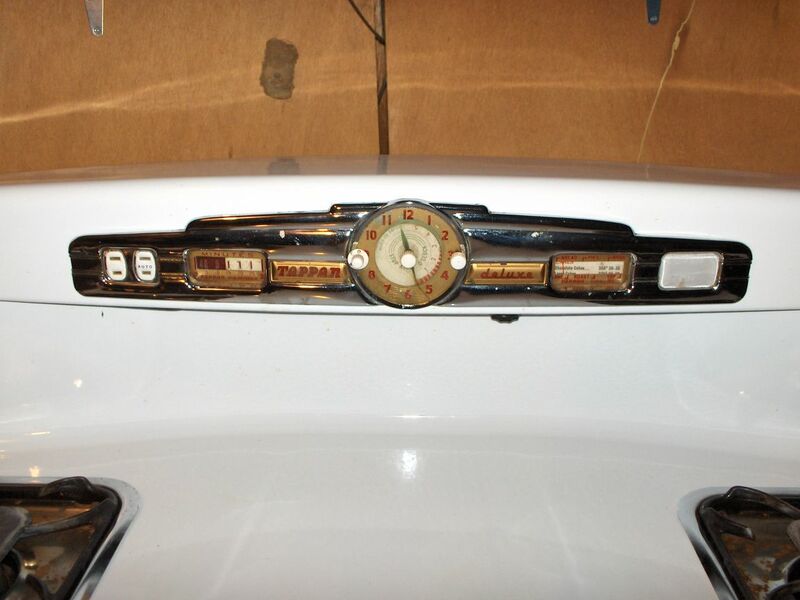 Odie, thanks for sharing your photos and keep us posted on your restoration! 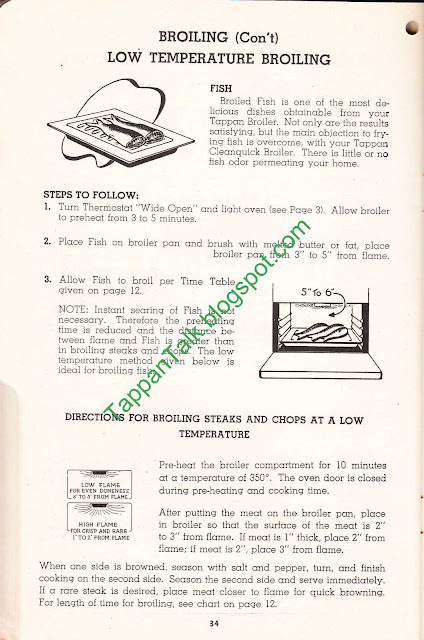 I recently received a question from a reader about how the Tappan Deluxe broiler works. Here's some information from the Owner's Manual. 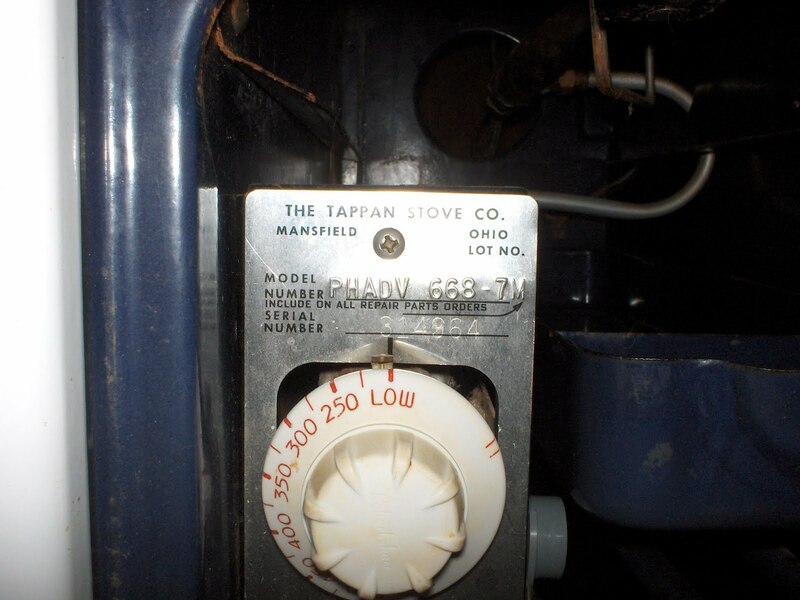 I received these photos from Ron of his mother's late 1930's Tappan stove. The back splash has the "opal glass floodlight", as well as a timer and Visiguide. I have included some marketing pieces below from 1940. The 640 model (second to the last picture) is very similar to this stove...except you will notice that the 640 has lift release buttons to open the storage compartments on either side and Ron's stove has turn knobs (indicating it's an earlier model). You can see in the marketing materials, the back splash varies slightly from model to model as the design evolved. 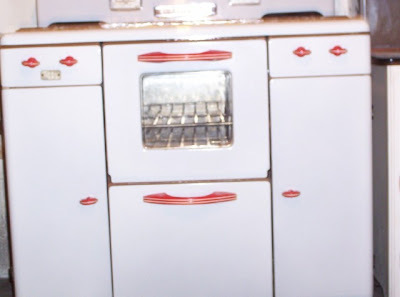 I love the charming red details on the burner knobs and oven/broiler handles! Tappan also must have liked this detail because they used it in a number of the marketing pieces below. Ron is looking for a new home for this stove. If you are interested, contact him here for details. Jeff and his wife just purchased a 1948 ranch house in Milwaukee that was part of an estate sale. 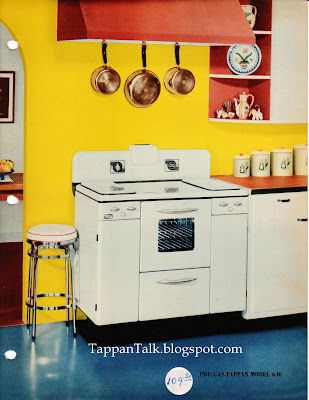 The house had been vacant for 13 years...and came complete with a Tappan Deluxe stove. The previous owners selling the house weren't sure anyone would want the old stove. 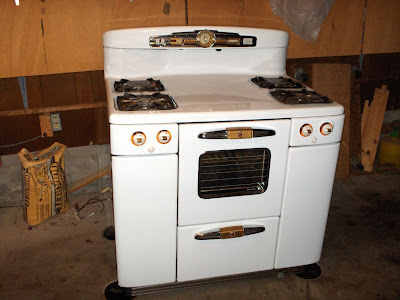 When Jeff & his wife asked for the stove, the sellers where happy not to have to get rid of it themselves. Jeff emailed me because he was able to get the oven to light up immediately, but only two of the top burners was working. We did some brainstorming & came to the conclusion that the pilot light to two of the burners was having some trouble lighting. 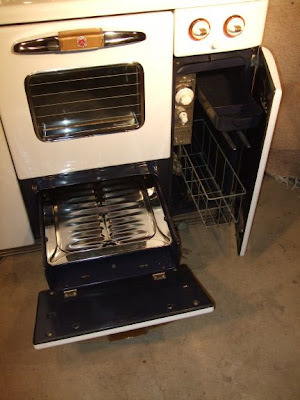 One of the first things I suggested was cleaning the burners (the holes can get clogged over the years). Also keep in mind that because it's a standing pilot, gas is always flowing to the burner. If the pilot is out, turn off the gas until you can get the pilot lit. After a little work, Jeff was able to get all burners working. He sent photos for us to enjoy. 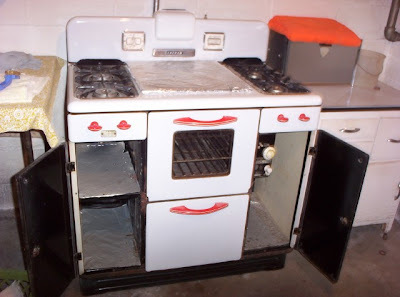 This is an earlier stove (we can tell by the pull chain for the light on the back splash). Model # TV 65-16. It has a Telechron clock. It's a virtual twin to my stove, except it has a chrome oven interior, a crisper draw in the left storage area and the pull out drawer/towel rack on the right. The house still has it's original vintage interior. Look at that great wall tile complete with the chrome trim on the corner....and swing out towel rack on the wall. Thanks for sharing your photos, Jeff! 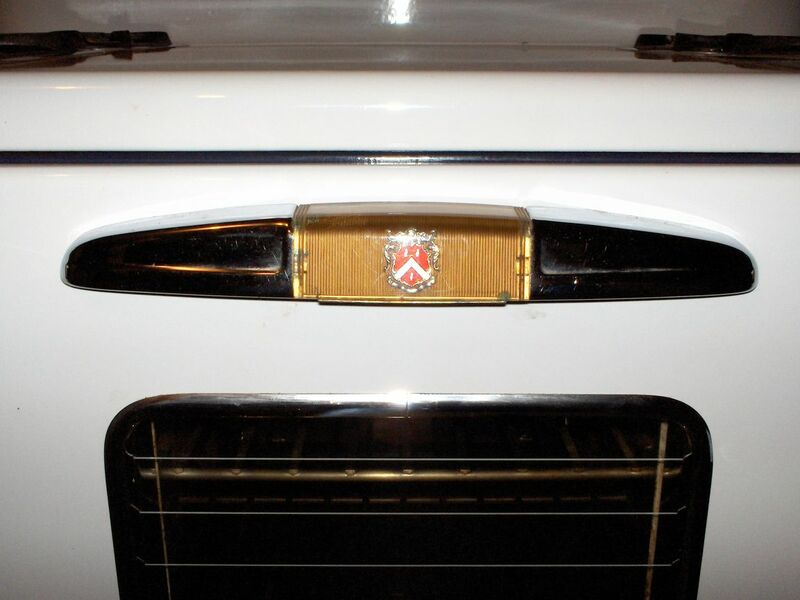 Tappan created these pyrogrates for their Tappan Deluxe stoves. They claimed that they supported small utensils without tipping and evenly distributed heat. I believe them. 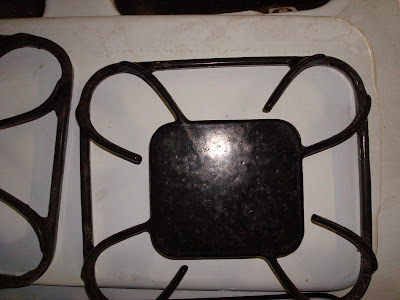 These grates typically sat on the back two burners, but can be arranged in any way to be convenient. 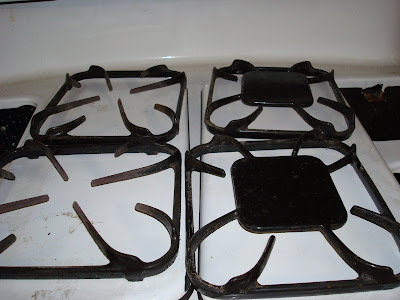 The burner grates also came in a version with a glass insert called Pyroglas that were produced by the makers of Pyrex ware. More on these in another post. If any readers have photos of their Pyrolgas to share, we'd love to see them. A big thanks to Ron & Aiden for sharing photos of their pyrogrates.